Camp Bow Wow Bridgewater dog training services are specially designed to enrich your pup. Our premier dog training services offer flexible programs for every dog. The training methods we use are designed using only reward-based techniques to ensure your pup has the most fun learning experience. Our programs are exciting, effective, and enrich canines of all ages and behavior levels. One of our Camp Bow Wow Certified Trainers will work to design a program that meets your needs and your schedule. Contact Camp Bow Wow at (732) 805-0888 to schedule a session! Camp Bow Wow Bridgewater offers several options for our canine training. Our Certified Trainers can work with your dog while they attend Camp, spending one-on-one time with them. We can also provide training services working with you and your dog in a private setting if that’s most comfortable for you. These sessions can help your pup overcome behavior issues or provide enrichment. Our Certified Dog Trainer, Alicia, completed an extensive training program with top dog behavior experts and can help you with anything from basic obedience and tricks, all the way up to the tougher issues like leash reactivity. Whether you want to participate in a group setting, take private lessons, or have us train your dog while you’re away, our trainers are ready to work with you and your pup. 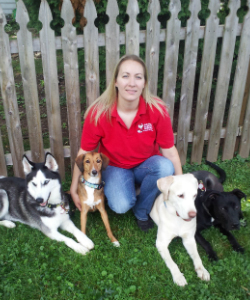 Alicia has had a lifelong passion for animals - especially for dogs. Alicia volunteers and fosters for Rawhide Rescue where she also gets to utilize her training skills. She spends much of her free time working with her own dogs as well as participating in agility competitions. She looks forward to sharing her skills and knowledge with our campers and their families. 6 week class. Prerequisite of Obedience I or trainer approval. Advanced behaviors like heel, place, and distractions. 6 week class. Prerequisite of Obedience II or dog trainer approval. Intense focus on solidifying behaviors. Last class includes CGC test. 6 week class. Focus on basic agility tasks (tunnels, see-saw, hoops, hurdles). 6 week class. Prerequisite of Indoor Agility I or dog trainer approval. Focus on more challenging agility tasks. 4 week class. Prerequisite of Basic Dog Obedience I or dog trainer approval. 1 hour class. Focus on one, specific behavior in a small class. Behavior varies for each workshop. 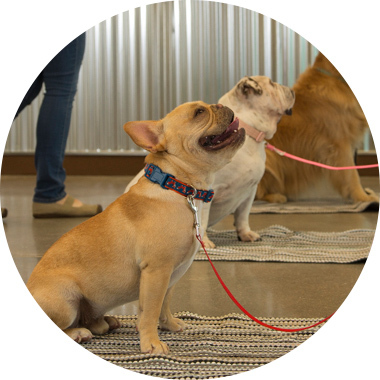 30-minute training session while your pup is at Camp Bow Wow for day care or boarding. Session prices are in addition to Day and Overnight Camp rates. Campers participating in this dog training must first pass our initial Meet and Greet. One hour session with you, your family and our trainer in your home. One hour session with you, your family and our trainer at camp.